Hello there! Here’s another bit to share from a Ladies Home Journal from 1898. 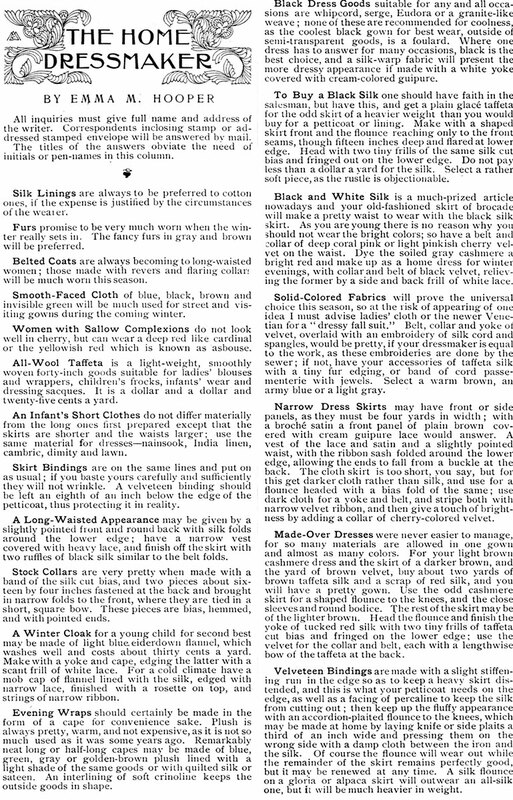 Here’s a page of suggestions for the home dressmaker. I think this term should come back- there’s been past discussion of the term “sewer”, which can mean one who sews, or a sewer for waste. So people call themselves sewers, seamstresses, sewists. I LOVE dressmaker. But I digress, here is the article- reformatted to fit easier onto the blog page. Also on this page was this cute ad. Don’t you LOVE the bicycle? Bicycling was hugely popular in the 1890’s for women, and somewhat shocking! You know those bike runs people have? We need an 1890’s one. Even I would go out and ride a bike if I could wear a costume like this. I also love the targeted marketing. We can see what the lady of 1898 would find desirable. You could probably substitute earning and iPad or teeth whitening today. Lol! Because the lettering and image are so cute, I have set them aside here for you to use as free clip art! Feel free to use for your blog or website. I’d love to see ads using the lettering below! I love all of them and have saved! They will be fun to use, Thanks for sharing! I love the term ‘dressmaker’ too, (and given that I seem to make mostly dresses, it’s particularly appropriate). ‘Sewist’ always seems a little clunky, and although I have no problem with ‘seamstress’, my Terry Pratchett-reading friends tell me that it has other connotations! I love the bicycle, I have saved a copy, thanks :) These old magazines are so fascinating.